June 10, 1922, Grand Rapids, Minnesota, 6:00 AM, CST. (Source: Birth Record) Died, June 22, 1969, London. In February 1937, Garland sang the song 'Dear Mr. Gable', which brought national fame. She signed a film contract a year later. In August 1938, 'The Wizard of Oz' was released, becoming a classic. Garland, neurotic, depressive with addictive tendencies, became a cult figure in the Sixties. In July 1947, she had a nervous breakdown, and her daughter Liza Minnelli (qv) had to rescue her mother from many attempts at suicide. When Garland was fired from MGM in June 1950, she was broke. "He gave me a look at myself I've never had before. He saw something in me nobody else ever did. He made me see it too. He made me believe it." Always be a first-rate version of yourself, instead of a second-rate version of somebody else. For it was not into my ear you whispered, but into my heart. It was not my lips you kissed, but my soul. "Hollywood is a strange place if you're in trouble. Everybody thinks it's contagious." Of her audience, she said, "I just want them to know that I have been in love with them for all my life, and I tried to please. I hope I did." Biography: Born Frances Gumm in Minnesota in 1922, Garland came from a vaudeville family and was introduced to the stage at just two years old. The act become the Gumm sisters, although Baby Frances was clearly the one audiences wanted to see and hear. A visit to Chicago was an important step for the girls, with the youngest once more attracting the most attention; here, at the urging of comedian George Jessel, they changed their name to the Garland Sisters. On their return to Los Angeles in 1934 the sisters played a successful engagement at Grauman's Chinese Theater in Hollywood. Soon afterwards Frances was personally auditioned by Louis B. Mayer, head of M-G-M. Deeply impressed, Mayer signed the girl before she had even taken a screen test. Frances now became Judy Garland. EVERY SUNDAY (1936) a short film with Deanna Durbin was Garland's first role at M-G-M. Her first major impact on audiences came with her third film, BROADWAY MELODY OF 1938 (1937) in which she sang "Dear Mr Gable". She was then teamed with M-G-M's established child star, Mickey Rooney, a partnership which brought a succession of popular films in the Andy Hardy series. By now, everyone at M-G-M knew that they had a star on their hands. This fact was triumphantly confirmed with her appearance in THE WIZARD OF OZ (1939), in which she sang "Somewhere Over the Rainbow", the song with which she would subsequently always be associated. She won a special Oscar as "the best juvenile performer of the year" for the role which originally had been intended for Shirley Temple. However, the price and pressures of such fame were high. It wasn't long before she first encountered drugs. Her friends began to notice alarming differences; a gaunt look from severe weight loss and dark - blue circles under her eyes. Besides psychiatric drugs, Garland was introduced to psychoanalysis. Judy decided to start treatment, seeing Menninger associate Dr. Ernst Simmel five mornings a week. With her personal life firmly on the downward slide towards later disasters, Garland's successful film career now took a further upswing. In 1942 she appeared in FOR ME AND MY GAL then made PRESENTING LILY MARS, THOUSANDS CHEER, GIRL CRAZY (all 1943), MEET ME IN ST. LOUIS (1944), THE HARVEY GIRLS, ZIEGFELD FOLLIES and TILL THE CLOUDS ROLL BY (all 1946). In 1945 she married Vincente Minnelli, who had directed her in MEET ME IN ST. LOUIS. It was M-G-M's biggest grossing film after GONE WITH THE WIND. In 1946 her daughter, Liza Minnelli, was born. The late '40s brought more film successes with THE PIRATE, EASTER PARADE, WORDS AND MUSIC (all 1948) and IN THE GOOD OLD SUMMERTIME (1949). Under psychiatrist's orders, she began the first of many stays in psychiatric hospitals. Then in 1949, not yet 27 years old, she was subjected to the violence and electroshock. She was also given hypnosis to "calm her nerves and help her lose weight". In 1951 her marriage to Minnelli finished, and she attempted suicide. Her subsequent marriage to Sid Luft and his handling of her career brought an upturn both emotionally and professionally. She made a trip to Europe, appearing at the London Palladium to great acclaim. Her film career resumed with a dramatic/singing role in A STAR IS BORN (1954), for which she was unsuccessfully nominated for an Oscar. A straight dramatic role, in JUDGEMENT IN NUREMBERG (1961), for which she was still nominated for an Oscar, enhanced her reputation. Despite the personal traumas and the professional ups and downs, Judy achieved another huge success with a concert at New York's Carnegie Hall on 23 April 1961, the subsequent album of the concert winning five Grammy Awards (and sold 2 million copies). Early in 1968, Judy went to London and there married her fifth husband, a 35 - year old discotheque manager named Mickey Deans. She began a three week engagement at a London cabaret, which turned out to be the worst flop of her career. Not only was she habitually late for performances, but her voice frequently cracked and she constantly forgot her lines. But she seemed to be recovering from the effects of this fiasco when sometime during the night of June 22, 1969, she stumbled in the bathroom of her London apartment. She was found dead in the morning by Deans. The official coroner's verdict attributed her death to an accidental overdose of sleeping pills. But Ray Bolger, Dorothy's Scarecrow friend in THE WIZARD OF OZ, commented: "She just plain wore out." Thousands of bereaved fans jammed the vicinity of the Manhattan funeral home where her body lay in state. 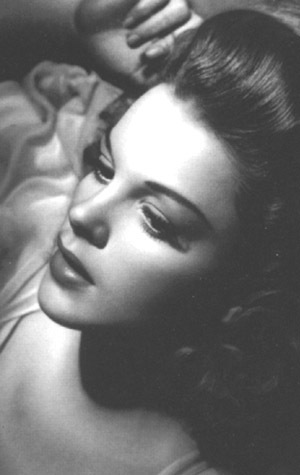 "Judy Garland worked for nearly forty-five of her forty-seven years. She made thirty-two feature films, did voice-over work for two more, and appeared in at least a half dozen short subjects. She received a special Academy Award and was nominated for two others. She starred in thirty of her own television shows (the programs and Garland herself garnering a total of ten Emmy Award nominations) and appeared as a guest on nearly thirty more. Between 1951 and 1969, she fulfilled over eleven hundred theatre, nightclub and concert performances, winning a special Antoinette Perry (Tony) Award for the first of three record-breaking Broadway engagements at the Palace. She recorded nearly one hundred singles and over a dozen record albums; Judy at Carnegie Hall received an unprecedented five Grammys in 1962 (including Album of the Year) and has never been out of print. Her radio work encompassed several hundred broadcasts, and she sang at countless benefits and personal appearances for the military. Earlier, between the ages of two and thirteen - and prior to signing her MGM contract in 1935 - she fulfilled hundreds of live vaudeville and radio dates with her two older sisters." When and where was Judy born? Frances Ethel Gumm was born on June 10, 1922 in Grand Rapids, Minnesota. Early MGM publicity material indicated she was born in Murfeesboro, Tennessee and that she was a year younger than she actually was. Why this misinformation was distributed by MGM is not clear. Frances Ethel was named after her father (Francis "Frank" Gumm) and mother (Ethel Milne), former vaudeville performers who bought a theater and settled in Grand Rapids. She was the third of three girls: Mary Jane (nicknamed Susie, variously spelled "Suzy") was born in 1915, and Dorothy Virginia (nicknamed Jimmie) was born in 1917. Frances was nicknamed "Baby", and was known as Baby Gumm until 1934 when she changed her name to Judy. 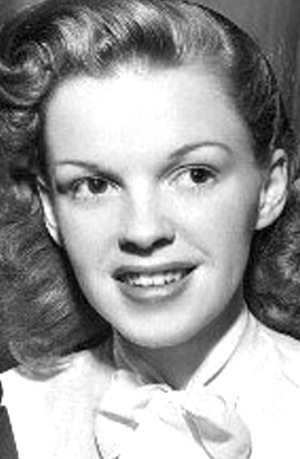 How did Judy get her start in show business? There are many variations on the story, but apparently Judy made her show business "debut" during a Christmas show at her parents' theater in Grand Rapids on December 26, 1924 (she was 2½ years old). She sang numerous verses of "Jingle Bells" and thoroughly enchanted the audience. Susie and Jimmie were already performing as a song and dance duo at the time. The sisters became a trio shortly after Baby's debut. They were billed as The Gumm Sisters, and appeared at theaters and social functions in and around Grand Rapids. In 1926 the Gumm family moved to Lancaster, California where Frank bought the local theater. The girls were soon taking dancing and acting lessons at various schools in the Los Angeles area. Ethel was the girls' agent and manager, and began finding bookings for the girls in theaters, night clubs and on radio. Within a few short years, the girls had a following of fans in the Southern California area, and were appearing regularly on local radio shows. When did Judy make her film debut? The Gumm Sisters appeared in a Meglin/Associated Films short subject entitled Starlet Revue (aka The Big Revue) in 1929. Judy was seven years old. The girls also appeared in three Warner Brothers Vitaphone short subjects in 1929 (A Holiday in Storyland, The Wedding of Jack and Jill, and Bubbles). In 1935, they appeared in an MGM short subject, La Fiesta de Santa Barbara, billed as The Garland Sisters. Judy's first feature film appearance was in the 20th Century-Fox hit Pigskin Parade in 1936 - the only time MGM ever loaned her out to another studio. 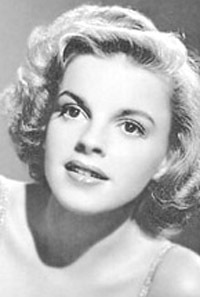 When did Baby Gumm change her name to Judy Garland? The Gumm Sisters traveled with their mother to Chicago in 1934 to perform at the World's Fair. While in Chicago, they appeared at the Oriental Theatre where George Jessel (a well-known comedian of the era) was headlining the bill. When Jessel introduced the Gumm Sisters to the audience, he noticed some quiet laughter, and later suggested to the girls that they change their name to Garland. Frances took the name "Judy" some time later because she liked the peppy sound of it, and she liked the Hoagy Carmichael song of the same name. The rendition of the song heard here is from the Judy Garland biodrama Rainbow. (©1975 Ten Four Productions/NBC, taped off-air). When did Judy sign with MGM? Dorothy with dog Toto in The Wizard of OzBorn Frances Ethel Gumm in Grand Rapids, Minnesota, she was born into a family of vaudeville players. One year, her parents and her two older sisters were performing in a Christmas show. Young Frances got on the stage and stole the show with a rendition of Jingle Bells; she was two and a half years old. The family soon moved to Lancaster, California and the Gumm Sisters began work on stage and in short films. Frances was soon known as Baby Gumm. In 1934, the Gumm Sisters were performing in Chicago with George Jessel. Jessel encouraged the group to choose a more appealing name. They settled on the the Garland Sisters, and young Frances chose the name Judy. Garland was signed at the age of 13 by Louis B. Mayer to a contract with MGM allegedly without a screen test in 1935 (she had actually made a test for the studio a few months earlier). Garland first got noticed by studio executives after singing "You Made Me Love You" to Clark Gable at a studio held birthday party for the "King of Hollywood". Her rendition proved so popular that MGM placed Garland (and the song) in their all-star extravaganza Broadway Melody of 1938 (1937). 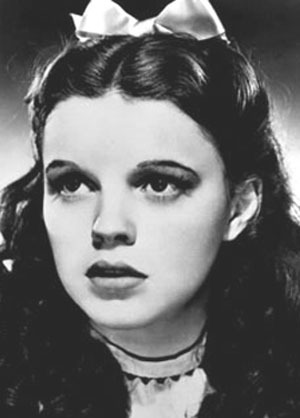 At the age of 16 (and after a string of unsuccessful films), she got the role of Dorothy in the film of The Wizard of Oz (1939), and was forever afterwards associated with the song, "Over the Rainbow". After Oz, Garland became one of MGM's most bankable stars, proving particularly popular when teamed with Mickey Rooney in a string of "let's put on a show!" musicals (The duo first appeared together in the 1937 b-movie Thoroughbreds Don't Cry, they became a sensation and they reteamed in Love Finds Andy Hardy and soon after in Babes in Arms) . She would end up starring with Rooney in nine films. To keep up with a frenetic pace of making one movie after another, Garland, Rooney, and other young performers were constantly given amphetamines, as well as barbiturates to take before bedtime. This constant dose of drugs would lead to addiction and a lifelong struggle for Garland as well as her eventual demise. She would also in her later life resent the hectic work and feel that her youth was stolen from her by MGM, and she was plagued with self-doubt throughout life and needed constant reassurance that she was talented, in spite of filling concert halls to hear her, high critical praise, and several awards. 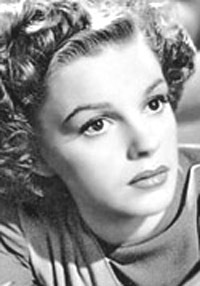 A young JudyThroughout the 1940s her films increased in popularity, making her the most critically and financially successful female musical star of the time. Among her most successful 1940s films is the 1944 classic Meet Me in St. Louis, in which she introduced three standards: "The Trolley Song," "The Boy Next Door," and "Have Yourself a Merry Little Christmas." Her other famous films include The Harvey Girls (1946) (in which she introduced "On the Atchison Topeka and the Santa Fe"), Easter Parade (1948), A Star Is Born (1954) (considered by many to be her best dramatic performance), and Judgement at Nuremberg (1961). She received an honorary Academy Award for her performance in The Wizard of Oz, and was nominated for Best Actress in A Star is Born, and Best Supporting Actress for Judgement at Nuremberg. Early 1960sWhen her MGM contract was terminated in 1950 (depending upon the source, she either asked to be released from the contract, or she was fired due her unreliability on the set of the musical Royal Wedding), Garland turned to television and live concert appearances. Throughout the 1950s and 1960s, she made enormously successful appearances in both media. Her concert appearance at Carnegie Hall on April 23, 1961 was a considerable highlight, called by many the "greatest single night in show business." The live recording made of the concert was a best seller (certified gold), charting for 73 weeks on Billboard (13 weeks at number one), and won five Grammy Awards including Album of the Year and Best Female Vocal of the Year. 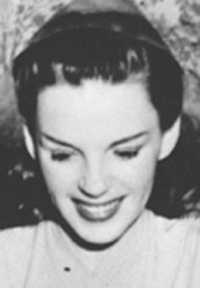 After hugely successful television specials and guest appearances in the early 1960s, CBS made a $24 million offer to Garland for a weekly television series of her own, called The Judy Garland Show, which was deemed at the time in the press to be "the biggest talent deal in TV history." The television series was critically praised, but, for a variety of reasons, lasted only one season, and went off the air in 1964, after 26 episodes. Despite this, the show won four Emmy nominations. The demise of the series was personally devastating for Garland. The shortcomings of her childhood years became more apparent as Garland struggled to overcome various personal problems, including weight gain, heavy drinking, and drug addiction. Her children are Liza Minnelli (who is now a legendary singer and actress in her own right), Lorna Luft (who is also an acclaimed singer), and Joey Luft (who is now a scenic photographer). Of Garland's five marriages, the first four marriages all ended in divorce. She died in 1969 at the age of 47 in London from an accidental overdose of barbiturates. Garland was interred in the Ferncliff Cemetery, Hartsdale, New York.